Any rebar supplier worth their salt can sell you stock rebar in the grade you need—even high strength 75, 80, or 100 grade. 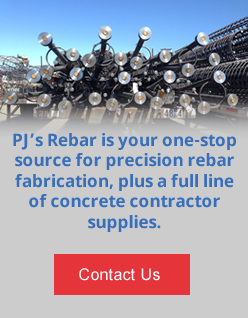 PJ's Rebar provides the rebar for your project with the added value of full-service fabrication. No matter what grade you’re looking for, we can deliver finished rebar that meets your unique specifications. We do the work so you don’t have to! 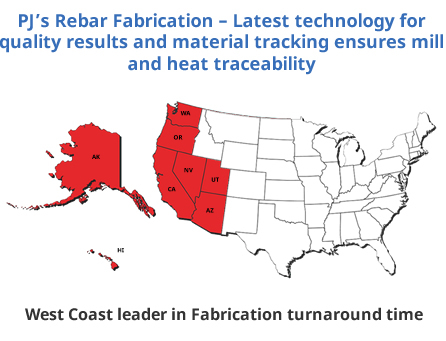 PJ's Rebar offers a range of rebar fabrication capabilities, including shearing, bending, spiraling, and more. We can also provide custom, preassembled rebar structures, such as footings, columns, beams, cages, and more. Our special dual grade rebar combines the strength and other physical characteristics of Grade 60 rebar with the weldability of A-706 rebar. It is available in #6 through #11 in coil and long stock. Other specialty types and grades may be available upon request. We work with long stock rebar in 20’, 30’, 40’, and standard 60’ lengths, as well as coiled rebar, and will cut to length to match your specifications. Our cutting and shearing processes are designed to minimize scrap and save you money in material costs. To guarantee quality and consistency, all fabrication processes are performed by our skilled, experienced team at our Fremont, California, facility. With PJ's Rebar as your single-source supplier for both rebar and rebar fabrication, you’ll save time, money, and headaches. No waiting on transit between the supplier and various fabricators, no need for multiple purchase orders for a single component of your project, and no struggling to cut/fit your rebar on the job site. Request a price quote on fabricated Grade 60, 75, 80, or 100 rebar, or contact us for more information.